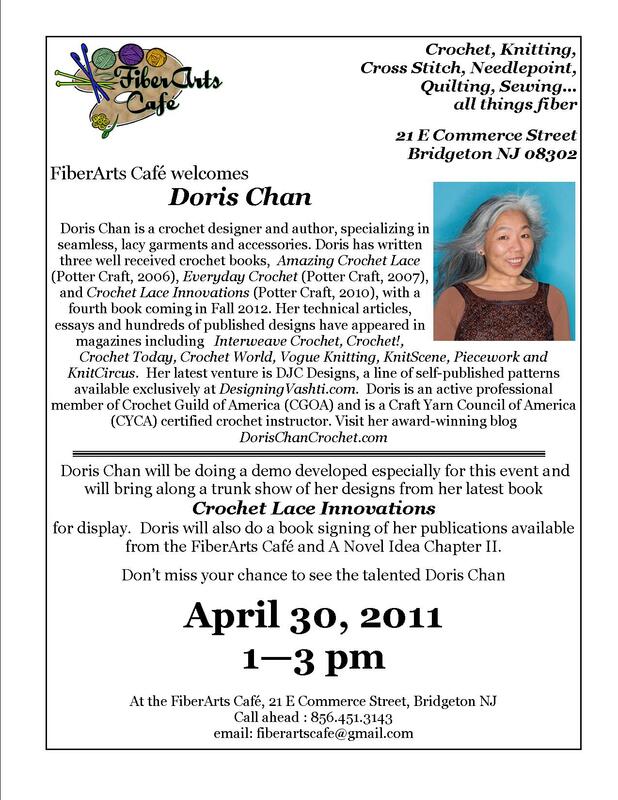 Hokey Smokes, I have been remiss about telling everyone about my upcoming visit to Carol Moore’s FiberArts Cafe on Saturday, 30 April, from 1-3 pm. Here, let Carol’s brilliant flyer tell the story. I will be bringing along Etimo cushion grip crochet hooks and free DJC Designs patterns for many lucky attendees, so please stop in. This entry was posted in crochet, events, free crochet pattern by dorischancrochet. Bookmark the permalink. Oy–wish I had known, I would have ventured south! It is now 2:50 pm!! Hope the demo went well!